The unthinkable appears to just have happened. The most financially successful pay per view of all time, Floyd Mayweather vs. Manny Pacquiao, sold millions of pay per views and was a world wide success. 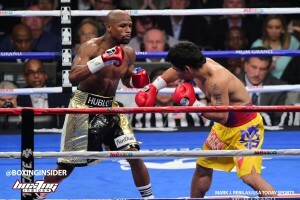 It was a fight that fans saw Mayweather win by comfortable margin. Afterwards, Pacquiao felt he did enough to win the fight and claimed he injured his shoulder halfway through. It took years for that fight to take place with a lot of negotiation and posturing on both sides. Many felt that fight took place a few years too late and there wasn’t a whole lot of commotion for a rematch. But Pacquaio is now a free agent, and one of the impediments that kept the first fight from happening, the fact both fighters were represented by two different promotional companies, is no longer present. In the clip, you can see Mayweather and Pacquiao talking in a club and hear Floyd tell some members of his entourage that he’s coming back in December. You can also hear Mayweather tell Pacquiao he doesn’t want to hear anything about his shoulder this time. No official announcement has been released about this alleged planned fight. HBO has appeared to be slowly backing out of the boxing business so it ‘s likely that Showtime will be involved. When something is officially announced Boxing Insider will let you know, but Floyd Mayweather has once again caused a big buzz in the boxing world.